Hummus is one of my all-time favorite foods (I say that *a lot*, don’t I?). It’s something that I can eat on almost anything – raw veggies, sammiches, straight off my finger. I recently had a version with a great Southern twist at Wisteria, a great local restaurant here in Atlanta. Their version was made with pureed black eyed peas! It was so flavorful…but was still true to the taste of hummus. The dish at Wisteria was served with sweet potato chips, which was a great combination. I devoured mine with Terra chips and some endive leaves. This is a recipe (thanks Chris for the recipe, btw!) that is very easy to adjust the texture on. 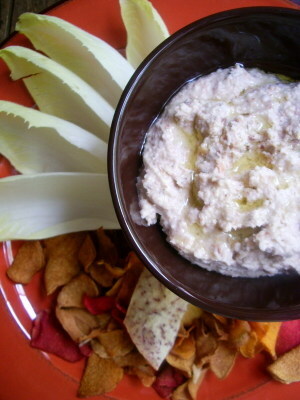 If you want it more dippy than hummusy, either use less tahini or shorten the time in the food processor. It would be a great – not to mention EASY – dip to take for outdoor gatherings or BBQ picnics. In a food processor with the motor running, add the garlic. When chopped, add the black eyed peas, lemon juice, olive oil, salt and pepper. Process until smooth. With the processor running, add tahini and process until all ingredients come together. Taste and adjust seasonings. If too thick, add additional lemon juice or oil. I am addicted to hummus. I love it on toasted pita with a spoonful of tabouleh. Kinda’ like a Leanese bruschetta. I make mine in a blender, the consistancy is smoother than when using a food processor. Can’t wait to try it with blackeyed peas. One of my favorites too. I have a red bean recipe that is virtually the same as my chick pea recipe. I am very very fond of hummus. I recognize those chips. They are very yummy and a nice contrast to the starchy yum-yums of hummus. This recipe looks like a great twist on hummus – thanks! Made your Blueberry Banana Bread yesterday – yummy stuff! Lordy lordy, I’m right there with you on the hummus thing. I could eat it everyday! I will be making this. YUM! Sounds marvellous! Plain old chickpea hummus with some pita bread is one of my favorite summer snacks. I like to sip some tart lemonade with it. It’s also great spread on a sandwich. Guess I know what is for lunch tomorrow! i have been making my hummus with black eye peas for years now, people alway rave about it. other variations that can be tried with other beans like navy, kidney etc. black eye peas seem to come out the best in my opinon. I was eating at a friend’s house in the suburbs. She made some hummus. She got the recipe from “this awesome internet foodie girl.” She called back today to let me know it was Running with Tweezers.